As the saying goes, those who fail to plan, plan to fail. 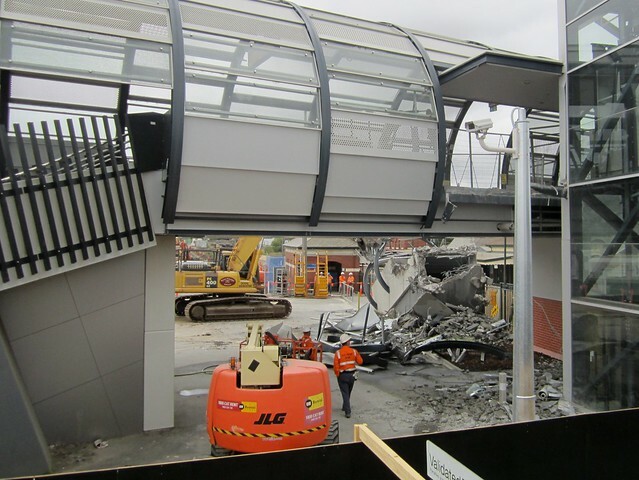 Similar things are happening in Docklands, with the main staircase at Etihad Stadium on Bourke Street being demolished because of new buildings springing up on each and every (smallest possible) space. But in another light – I think of Peninsula Link and how it is 2 lanes in one direction, just wait until traffic jams at either end see people question why it wasn’t built as 3-lane carriageways. Are the contractors for the freeway, and the footbridge in Footscray, perhaps building obsolescence into the projects, so they guarantee work in years to come when improvements are to be made? Or – are they just plain stupid? Only demolished half the ugly thing. What a shame. They should start again. A simple example that really highlights the lack of real public transport planning in Victoria. The footbridge is not obsolescence so much as project conflict, but it reflects the method of planning, where every project is conceived as a self-contained problem. In a better world the strategic plan would outline how they want to shift the system from the current state to one that is faster and more efficient, and every project, no matter how small would bring the plan closer to those goals, though never to completion. In that way the combination of projects becomes greater than the sum of its parts, and what they should be is relatively clear. Not that some project conflict isn’t inevitable, but to get back to Daniel’s end-point, if the strategic plan specified that interchanges are the way ahead, then even if an interchange wasn’t built then, the footbridge and surrounds should be designed such that it can be. Interesting, the text on the RRL site says ramps from Irving/Hyde but the images show a lift. 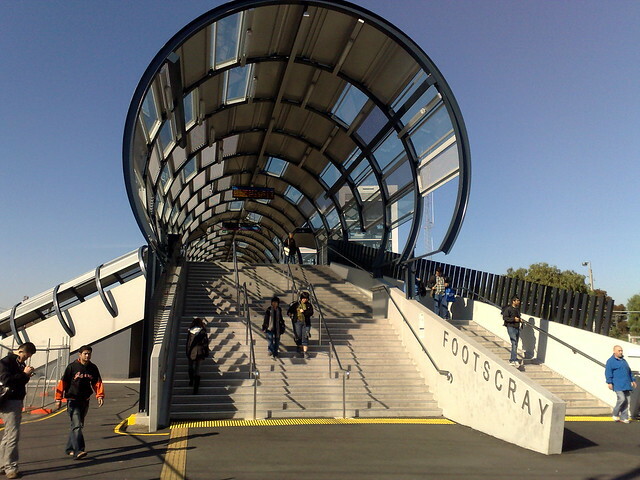 The West Footscray and Sunshine pages say stairs, lift and ramps, but the images don’t show the latter. Tottenham makes no mention of any changes, so we can assume the steep ramp up to the platform will stay. Splendid. People should question the design of the stations too. Eg, Southern Cross Station recently got thin plastic sheets as a roof…it was hit by hailstones and got torn in several places. Did they not think we get hail in Melbourne? And why do stations now need to be in expensive angular shapes with wooden ceilings…my local supermarket is in a box shape and it looks fine. And meanwhile, the first letter in The Age today, is an architect complaining about public scorn. 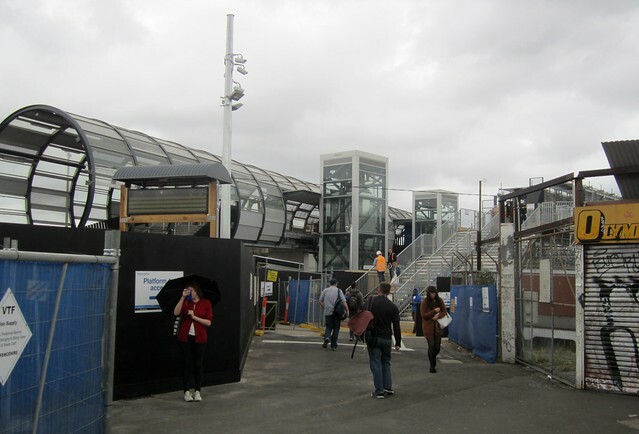 This page talking about Tottenham station shows the Sunshine Road/Ashley street entrance and it does indeed look like the ramp stays…BUT we do get a flashy post modern piece of stainless steel looming above the entranceway. Somewhat reminiscent of a guillotine don’t you think? Speechless. All I can say is LOL! They’re using Agile methodology, where some rework/throwaway of components can be expected. The alternative is to plan to the infinite degree, and not start until everything is known, via countless planning studies. Now, which method of government is prefered? The “methodology” referred to actually displays a complete lack of understanding of urban design and utter disrespect for the people who live along the corridor or who must interface with it. The truth is there was NO planning for the urban fabric interface – this is a mess made by engineers and bureaucrats. The amount of public money that is being wasted on this project is just staggering – as is the damage done to the surrounding communities. I note also the sheer ugliness of the “design” of this project. 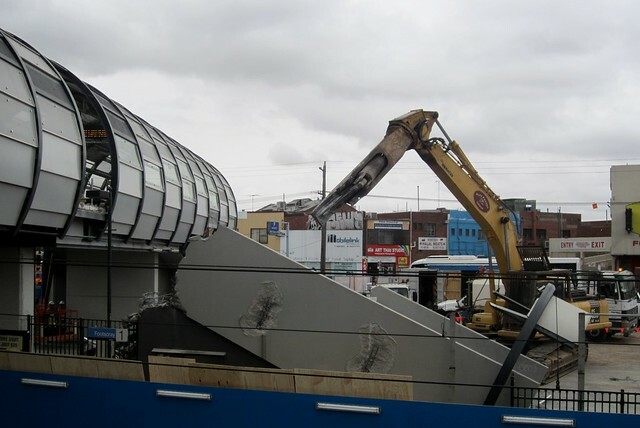 Footscray’s lovely old – very historic – station is now a complete mess thanks to the RRL. This is exactly what happened at Nunawading station with Myki. only to reinstall it all again at the new one. Government is an expert at wasting money. I hope the escalators they install are wider than the ones at North Melbourne station. They aren’t wide enough for a someone walking to pass a stationery person. They should never have built the damn thing in the first place. The old ramps were perfectly fine (for me, at least). If they hadn’t built that monstrosity it’d have been a LOT easier for the RRL.